Your company can easily switch over from clean natural gas to environmentally friendly and 100% renewable biogas. Biogas is no different from natural gas in terms of usage properties, so it can be used wherever natural gas is used. 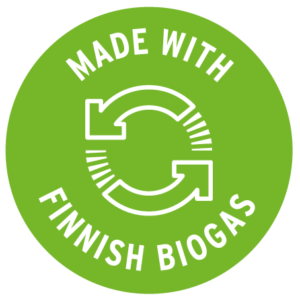 Biogas is produced in Finnish biogas plants from sources such as biodegradable household and industrial waste – switching over to biogas is an environmentally conscious company’s choice! Decision to switch over biogas. Kaikki kaasunjakeluverkon alueella sijaitsevat yritykset voivat siirtyä käyttämään biokaasua. Siirtymällä 100 % uusiutuvaan ja suomalaiseen biokaasuun nollaat yrityksesi hiilidioksidipäästöt! Let our customer service know if you’re planning to switch over. You can easily notify Suomen Kaasuenergia of your decision by contacting us by telephone at +358 (0) 20 690 027 (weekdays 8 am–5 pm), by e-mail at asiakaspalvelu@suomenkaasuenergia.fi or with our electronic contact form. Hey Presto! Biogas is at your service. You can use the gas for your company’s processes and heating just like before, as the properties of biogas are equivalent to those of natural gas. The only difference is that biogas is fully renewable energy, and your carbon dioxide emissions will be down to zero from now on! Become entitled to use the Biogas Label. When your company utilises biogas, you can use the Biogas Label to send a message about your company’s values and environmental responsibility. Ask for more information about Biogas label!